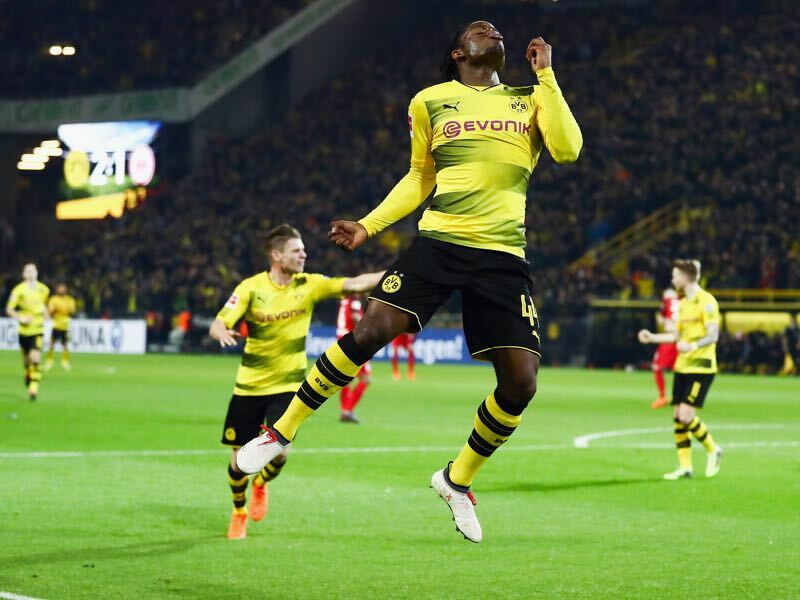 Dortmund vs Frankfurt threatened to become a dull affair until both sides scored four times in the last 15 minutes to combine for five goals and last minute heroics by Michy Batshuayi that secured BVB’s victory. Michy Batshuayi scores two to secure Dortmund’s victory. Christian Pulisic with two key assists. Hard working Eintracht Frankfurt undone at the last minute. It was a good start to a match in which there was very much on the line. Peter Stöger made some significant changes to his squad leaving out Mario Götze and Michy Batshuayi for Maximilian Philipp and Christian Pulisic. The changes meant that the attacking four played a fluent attacking lineup with Marco Reus, Christian Pulisic, Philipp and André Schürrle switching positions. The formation worked well, and BVB had the majority of chances with Reus (6′) missing the target from close range and Schürrle (9′) putting a header wide after a great Pulisic cross. At that rate, it was only a matter of time for Dortmund to score. The goal did finally arrive in the 12th minute with Pulisic sprinting down the right wing and putting in a hard cross that was supposed to find a sprinting Reus, but Eintracht defender Marco Russ tried to clear the ball, which to the dismay of the Eintracht fans found the way in his own. Dortmund continued to press, and Schürrle (22′) had the biggest chance to increase Dortmund’s lead before halftime further. Instead, Eintracht Frankfurt started to press ahead of the halftime whistle, but could not find an equaliser. Eintracht Frankfurt’s high press continued in the second half, and Kevin-Prince Boateng almost found an equaliser in the 47th minute trying to beat BVB keeper Roman Bürki with a backheel, and the Swiss keeper had to do well to stop the attempt. Frankfurt had the better part of the play in the opening stages of the second half as they were aided by a nervous looking Dortmund backline. It seemed to be the same old for Borussia Dortmund. Starting games well Dortmund seem to fall flat towards the end of the first half and the same was the case tonight with Eintracht Frankfurt finding the equaliser in the 75th minute. Jonathan de Guzman brought in a fantastic freekick cross into the box where it found the head of Luka Jović, who scored the equaliser with a great header. The goal instantly woke Dortmund up, and just two minutes later Pulisic and Michy Batshuayi combined well allowing the Belgian to go one-on-one with Eintracht keeper Lukas Hradecky, and the striker made no mistake to make it 2-1 in the 77th minute. Dortmund could have probably sealed it with Batshuayi dancing through Frankfurt’s defence in the 84th, but instead of passing the ball to the centre to Schürrle he looked to shoot himself, and his shot was blocked. As a result, it was a nervy ending for Dortmund once again, and in the 91st minute, Danny Blum found the equaliser completing a great cross by Danny da Costa. It once again appeared that Dortmund had squandered a lead falling short of expectations once again. Dortmund, however, showed that they had refound their mentality and just ahead of the final whistle Batshuayi stole away from his defenders scoring a fantastic volley from a lopped Lukasz Piszczek assist. After not scoring in three Bundesliga matches in a row BVB head coach Peter Stöger opted to leave Michy Batshuayi out of the starting eleven. 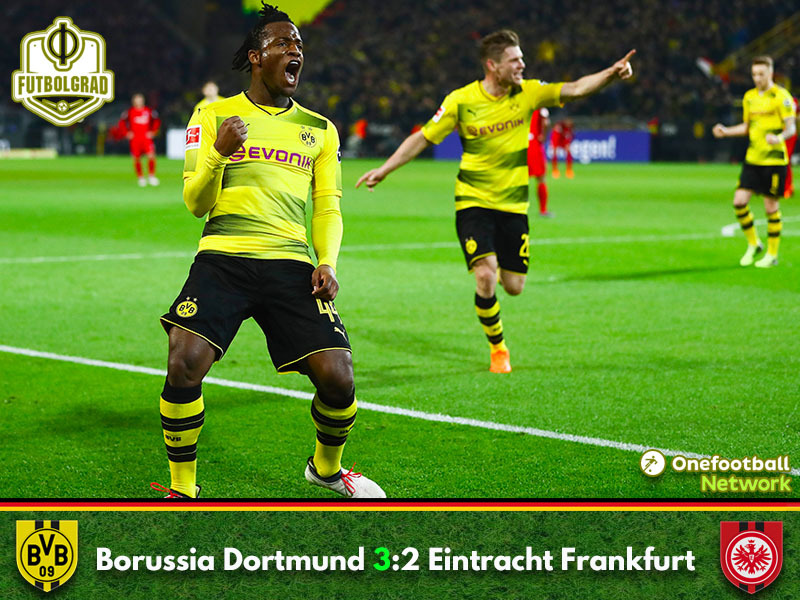 But with Dortmund struggling in the second half Batshuayi was unleashed in the 62nd minute, and the Belgian forward became the man of the match scoring Dortmund’s second goal and the game-winner in the dying moments of the game to end his crisis and give Dortmund a massive advantage in the race for the Champions League spots. Once again Dortmund took the lead after a furious start only to fall flat after about 40 to 45 minutes. Head coach Peter Stöger has to find a way to keep his side’s concentration up throughout the game without sacrificing to much-playing culture. Currently, Dortmund are a far cry from the spectacular Thomas Tuchel side of the 2015-16 season, and it was only thanks to a furious finish that Dortmund were able to collect all three points tonight. Marco Russ has now scored five own goals in the Bundesliga, only Nikolce Noveski and Manfred Kaltz (six each) have scored more in the competition. Luka Jović leads the league with four goals scored after being brought on as a substitute. The last five goals in the Bundesliga, which were not own goals, were all scored by substitutes.